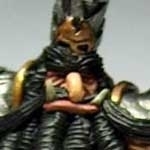 This forum is for Trading minis. Wyrd holds no responsibilities nor does it vouch for any post contained here in. For Sale, Malifaux Guild Lady Justice Ortega Crew Very Well Painted.